The Supreme Court today directed the Kolkata City Police Commissioner Rajeev Kumar to make himself available for investigation by CBI in relation to Saradha chit fund scam case. The CBI has been restrained from arresting Kumar. The questioning of Police Commissioner has been directed to be made at a neutral place, Shillong. The Attorney General K K Venugopal submitted that there was a serious breakdown of law and order in the state. "Can the state police confront Centre's police which is acting pursuant to the orders of this Court? ", asked the AG, referring to the 2014 judgment whereby SC directed CBI to take up the investigation of the case. 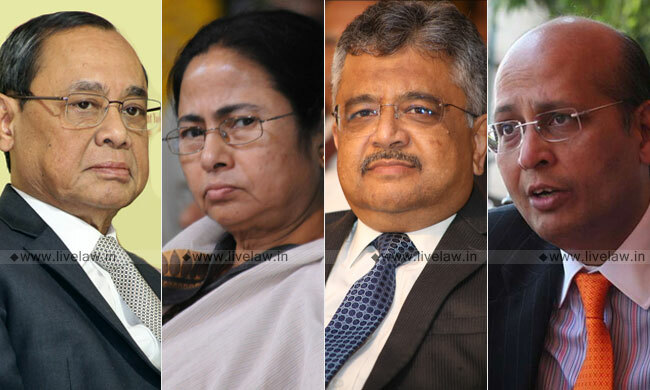 The bench headed by CJI also agreed to issue notice in the petition filed by Attorney General K K Venugopal for taking contempt action against West Bengal Government Chief Secretary, DGP and Kolkata Police Commissioner.They have to file reply by February 18. Dr.A M Singhvi, appearing for State of West Bengal said that the whole episode was an attempt to "humiliate and harass" the state government. He said that the CBI should have approached the Calcutta High Court first. Yesterday, Solicitor General Thushar Mehta had mentioned the matter before the bench of CJI, stating that police officials were stalling CBI investigation. He also voiced the apprehension that the police was trying to destroy evidence. The CJI however observed that there was nothing stated in the application which suggested destruction of evidence by Kolkata police. "If the Police Commissioner or anyone else is even thinking about destroying any evidence, we will come down so heavily that they will regret it", assured the Chief Justice yesterday. It was on Sunday night that dramatic events unfolded in Kolkata when CBI officials who attempted to enter the residence of Kolkata police chief Rajeev Kumar for interrogation were detained by WB police. West Bengal CM Mamata Banerjee alleged that Centre was misusing CBI for political gains. She is staging a protest dharna at Metro channel area. "This is a constitutional breakdown. It is my job to protect my officers", she reportedly said. She added that CBI cannot enter the commissioner's house without warrant.